Kirby has long been a major icon for the Nintendo and many have learned to love our cute round hero ever since the emergence of Kirby’s Dream Land. 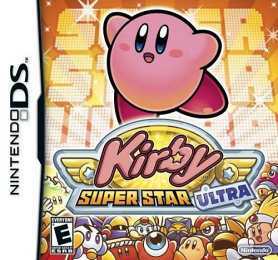 When the Nintendo DS was released, fans knew that it would only be a matter of time before Kirby made his appearance in the new system. Sure enough, Kirby came rolling into the DS scene, as round as ever. Even though Canvas Curse looks quite familiar, you’ll be quite surprised on its new and unique innovations. Kirby Canvas Curse makes an improvement in graphics. Stages are now beautifully colored and vibrant. Also Kirby takes on a change in form, he got rounder. In Canvas Curse, Kirby gets cursed and loses his limbs. He needs to roll to move around. The biggest and most exciting change in this title is its controls. It is now completely stylus-based and there is no way to control Kirby directly. When drawing in the touch screen, you leave a rainbow path. When Kirby comes into contact with these rainbows, he immediately rolls along it. This is how you move Kirby around and get to places you need to be. Also, tapping on Kirby gives him a boost to start up his momentum. In fighting enemies, you can tap on them with the stylus to stun them and let Kirby roll into them. Even though the rainbow concept is quite simple, it is pretty unique and effective. Canvas Curse challenges the player to be creative and use the rainbow to fit his needs. Because you can draw the rainbow anyway you like, the game becomes non-linear and different players may not finish the same stage the same way. Kirby Canvas Curse gets special recognition for being one of the first to bring such an innovative idea to the Nintendo DS.